The nature of that statement, again- just in my humble opinion, is what gives gardening a bad name. A “perfect garden” is the misguided goal of almost every novice or want to be gardener. The innocent lack of hands-on experience coupled dreams of perfection leads many new to gardening to throw up their hands and declare they have “brown, or worse, black thumbs.” The idea that there is perfection in any garden is also the ultimate illusive dream of any perfectionist turned gardener, myself included. A misconception that any garden can ever be perfect is the ultimate trip of a gardener’s ego. As a recovering perfectionist and gardening addict, I can make these statements! A flower, in and of itself- now that is perfection of the natural world incarnate . A garden, no. The notion that a garden or lawn, etc. can or even should be perfect is the concept that leads home owners and gardeners to the indiscriminate use of massive amounts of pesticides, herbicides, and fertilizers. A better concept, one of “the perfection of imperfection” is the best attitude to have when surveying the landscape of your garden. Yes, pun intended. 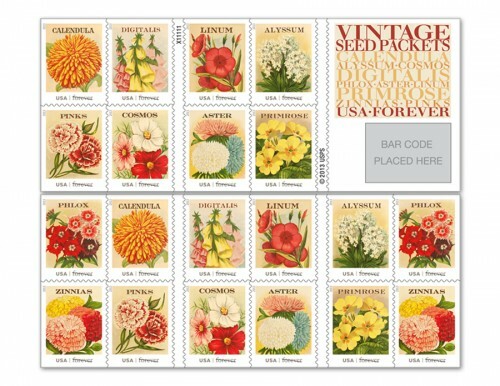 Another irony of the USPS concept statement relates to the specific choice of flowers to depict for the seed packet images. Most of these flowers are old fashion plants and wildflowers which by their very nature are carefree. They are not the typical foliage and flora expected in a “garden of perfection!” Another opinion- a better goal could have been to simply encourage Americans to celebrate the gifts that gardening has to offer, and to appreciate the joy in the simple beauty of flowers.